Eastleigh beat Reading 2-1 in their first pre-season friendly ahead of the 2018/19 season at the Silverlake Stadium. Paul McCallum and Ben Williamson were on target for the Spitfires. Eastleigh have secured a double signing in the form of 24-year-olds Alex Wynter from Maidstone United and Joe Jones from Woking. Spitfires manager Andy Hessenthaler commented: “My remit over the summer was to bring the average age of the squad down and that is exactly what I have managed to achieve. "The players we are signing, all have bright futures and hopefully that lies with Eastleigh Football Club. “The Chairman and the other directors have been excellent this week in allowing me to make further signings. Alex Wynter said: “I am really pleased to be on board. "After speaking to the gaffer and hearing his plans for the club, I couldn’t say no. 23-year-old defender Josh Hare has signed a one-year deal with Eastleigh to become Andy Hessenthaler’s second signing of the summer. Hare was most recently at Maidstone United in the National League and has also played for Leatherhead, Eastbourne Borough, and Gillingham. 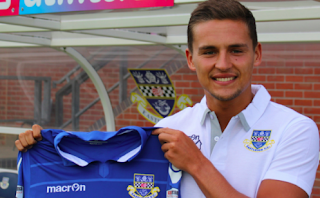 Upon signing for the Spitfires, Josh said: “I am really pleased to join Eastleigh. A major factor for me was the chance to join a full-time club. "Being able to concentrate on my football every day was a no-brainer. “I am an ambitious player and the club are equally as ambitious. "We all want to be successful here and hopefully we can achieve our targets. Eastleigh boss Andy Hessenthaler said: “I am delighted to secure the services of Josh. "He is young, versatile and attacking. He is exactly the type of player we want to bring to the club. 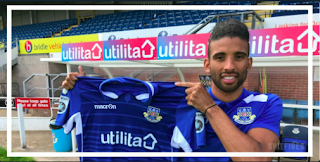 Eastleigh has announced the signing of 27-year-old midfielder Oscar Gobern on a one-year deal. Gobern, the Spitfires' first signing of the summer, came through the ranks at Southampton and played a role in helping the club win promotion from League One to the Championship. His previous clubs also include MK Dons, Queens Park Rangers and Yeovil. First Team manager Andy Hessenthaler commented: “I am absolutely thrilled to get this over the line. "He has a decent pedigree and has played at a good level. He is young and hungry and will be a big addition to the playing squad. Upon signing for Eastleigh, Gobern said: “After speaking to the gaffer and Strevs (Ben Strevens), it was clear what their intentions are and it was a no-brainer for me to come down.